Musings on sustainability and sustainable innovation. This past spring, I had the unique opportunity to tour the Pinal Airpark, thanks to my company’s participation in the International Aerospace Environmental Group. 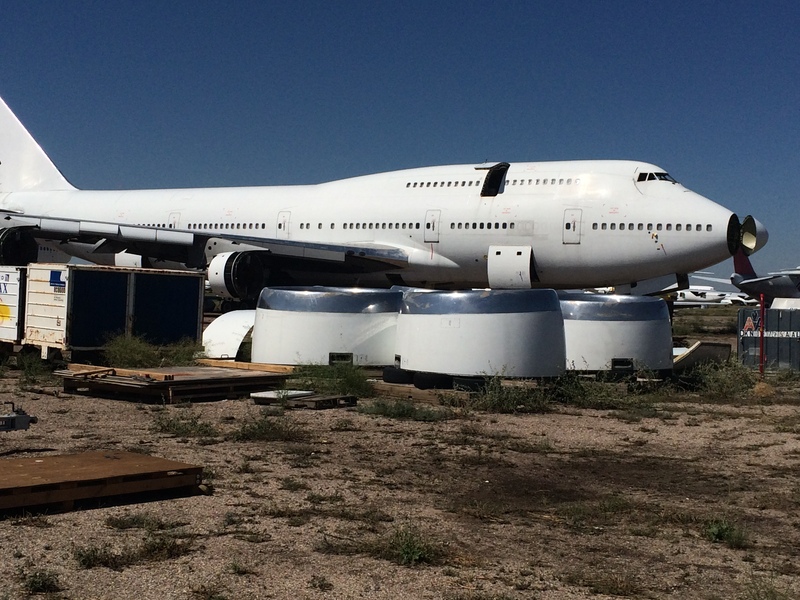 This included the amazing opportunity to walk through a Boeing 747 that was being disassembled and recycled that week. Here’s what I saw and learned. Planes that will be decommissioned fly here (it’s also a working airfield, with runway), or if they can’t, a team goes out and chops them into pieces that can be shipped via shipping container. The owner of the aircraft gives the recycling company a “harvest list”, or list of parts — in the hundreds, sometimes in the thousands — that they want to recover and either reuse, resell, or recycle for raw material. 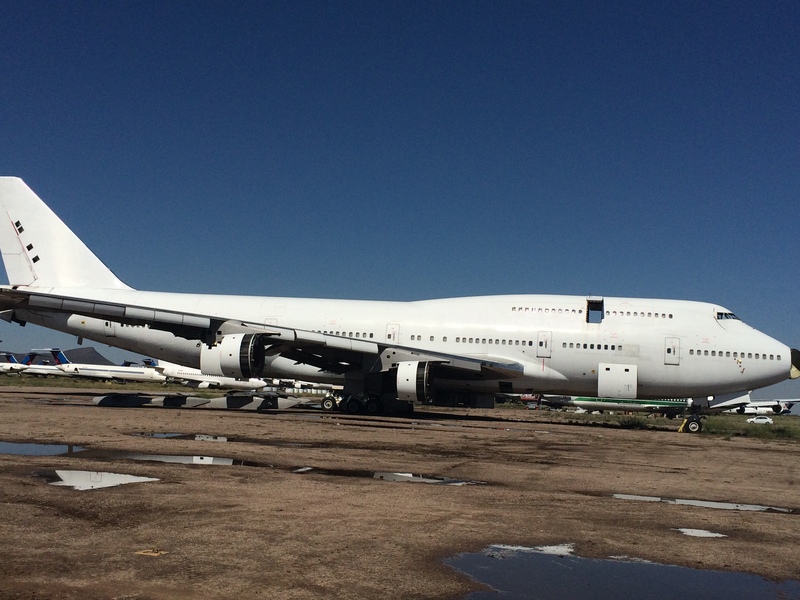 Here is one of the three Boeing 747-400s (“whales”) that were being parted out. As Pinal is in the Sonoran Desert, the dry conditions preserve the planes fairly well, although you can tell from the puddles that it does occasionally rain. First, they wrap the parts that are sensitive to dust in aluminum foil: the windows, the engines, and the landing gear (pictured here). The foil is changed every 30 days. The engines and landing gear are two of the most valuable components, so these will definitely be harvested if they’re in usable condition. To remove the gear, they hoist the whole plane up onto railroad ties. 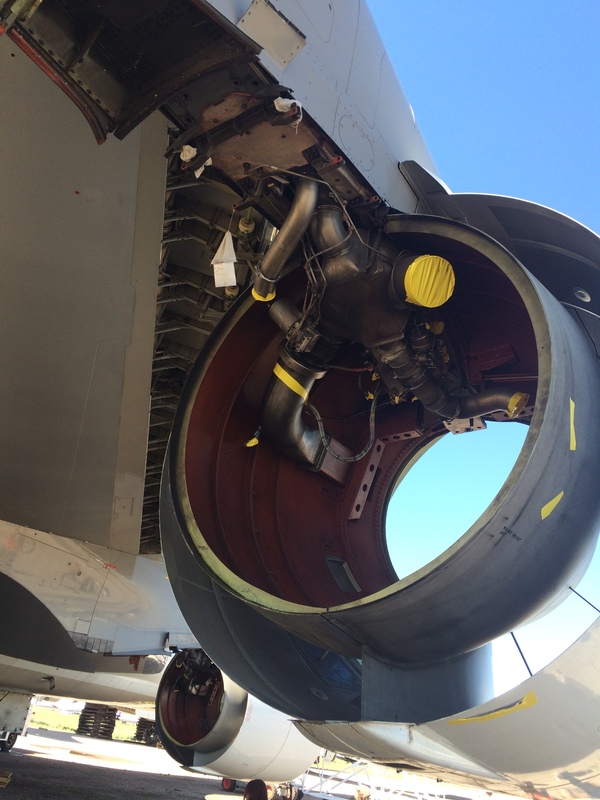 The engines from this 747-400 have already been harvested! Note also that the fuel has been drained (as have all other hazardous liquids), and the fuel lines sealed. As another safety precaution for the recycling workers, the auxiliary power unit (APU), which generates non-propulsion power (e.g. 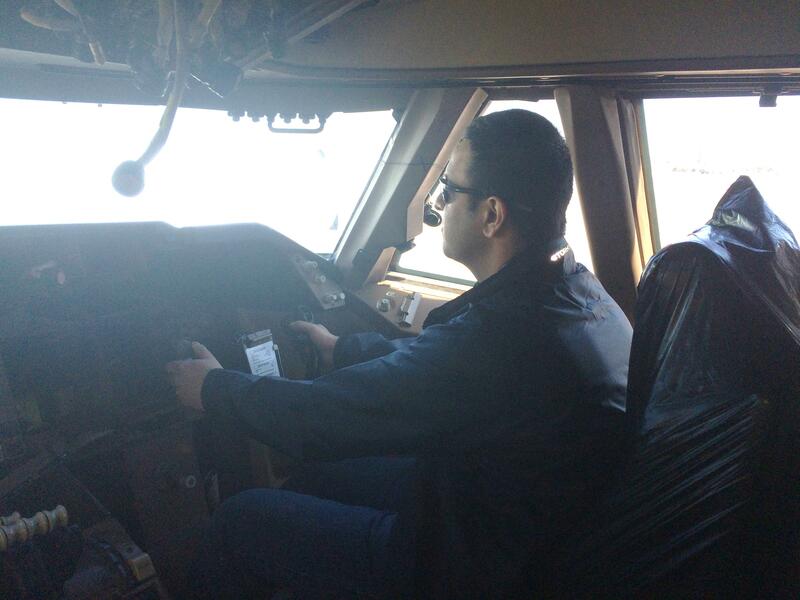 electricity) during aircraft operation, has also been removed. They drain the fluids into these “cookie tins” as they call them. 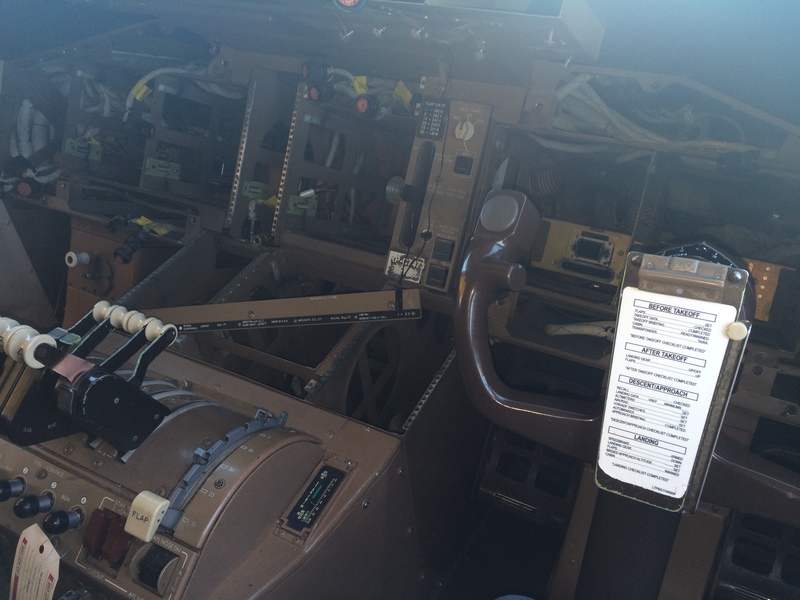 Here’s the cockpit of the 747-400, stripped of the miles upon miles of copper wiring, which is a valuable commodity. Here you can also see the famous pilot’s takeoff checklist. Believe it or not, we also found an operating manual for the 747-400… it was typewritten! All I need is fuel. And engines. They, strip the galley too. 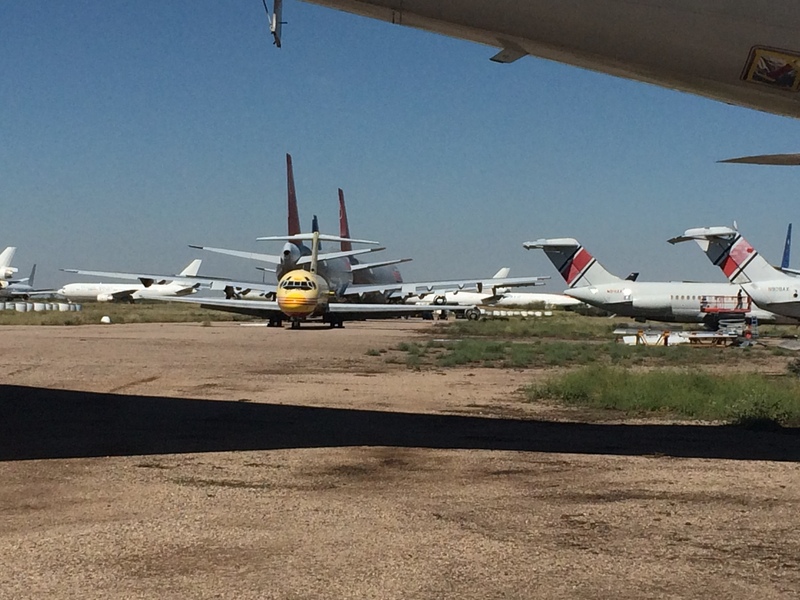 …As well as old planes that sit before they’re needed. Sometimes they’re grounded here because airlines don’t need to fly all their planes. 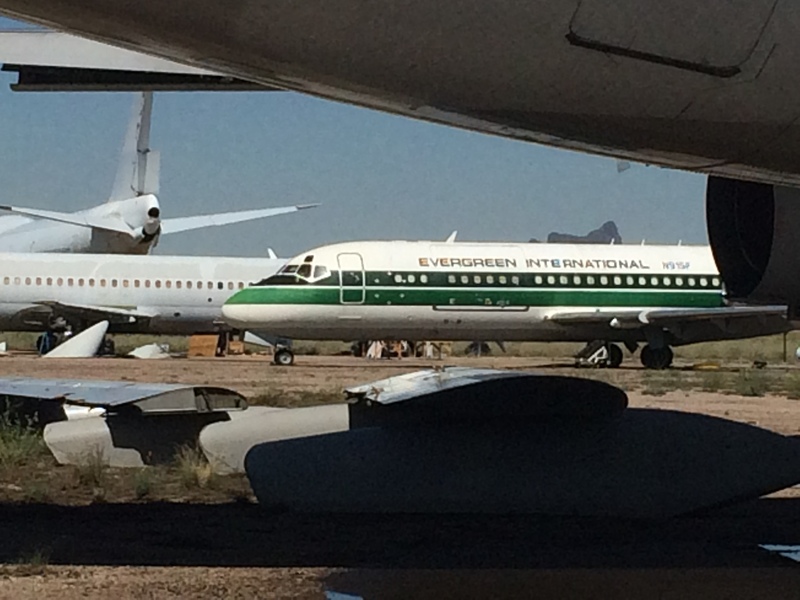 This particular plane (a McDonnell Douglas DC-9?) 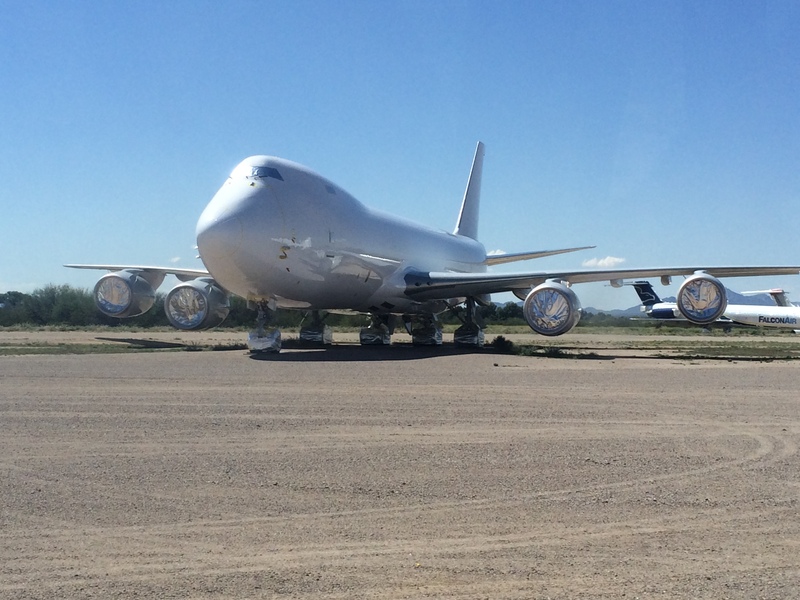 has been sitting here for 17 YEARS, and is now being recommisioned to fly as a cargo plane again!! Note the logo: Evergreen International was apparently a notorious clandestine ops company used by the CIA, like Blackwater now. The US attempts to overthrow the Sandinistas in Nicaragua apparently flew out of this airfield – perhaps this very plane! This DHL plane was first used as a passenger plane, then retrofitted for cargo. 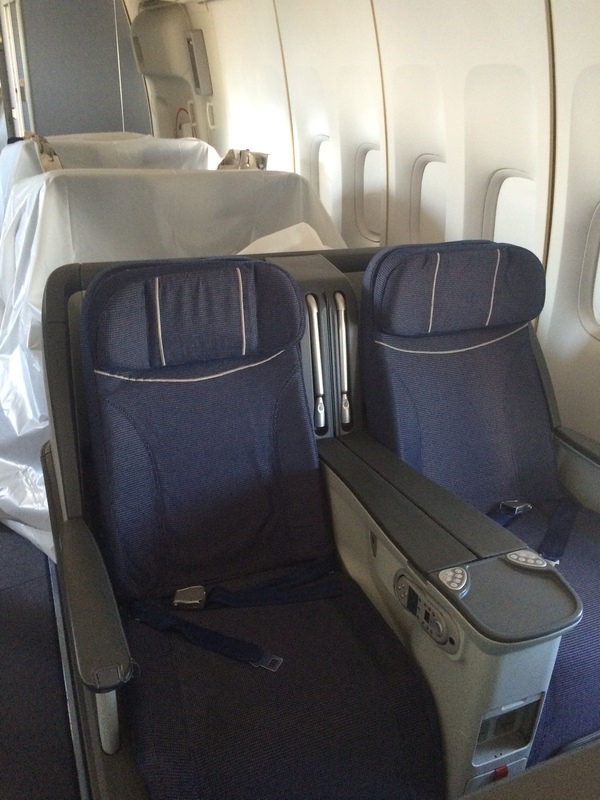 It doesn’t have a cargo door, just one normal L1 passenger door, so it could only be used for small parcels. 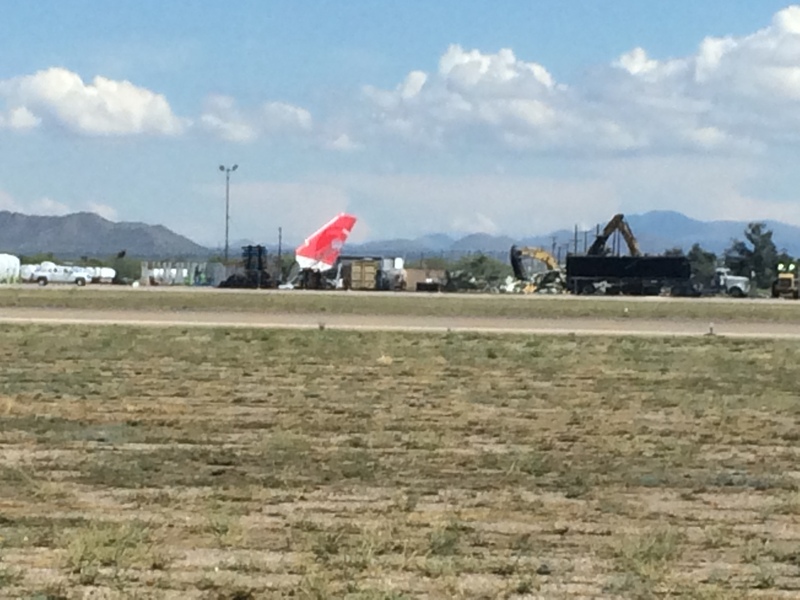 Consequently, they’re stripping it for parts for the DC-9 retrofit pictured above. 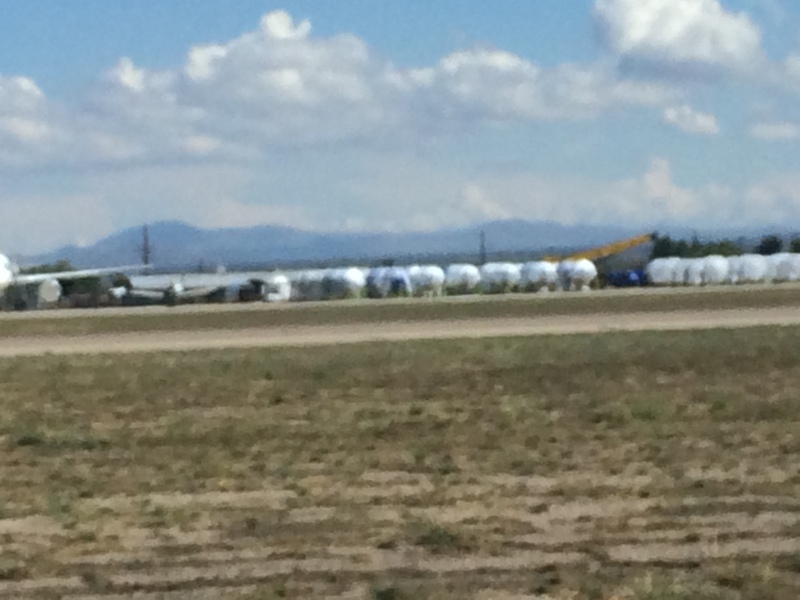 Kind of blurry but these are engines all wrapped up. Engines are among the highest value parts, containing lots of high value metals, and sometimes can even be used again in an aircraft. Here, a crane and cutting tools are used to section and shred the aircraft body for scrap aluminum after the owner’s harvest list (which can be 500 to 1500+ parts) has been removed from the plane. 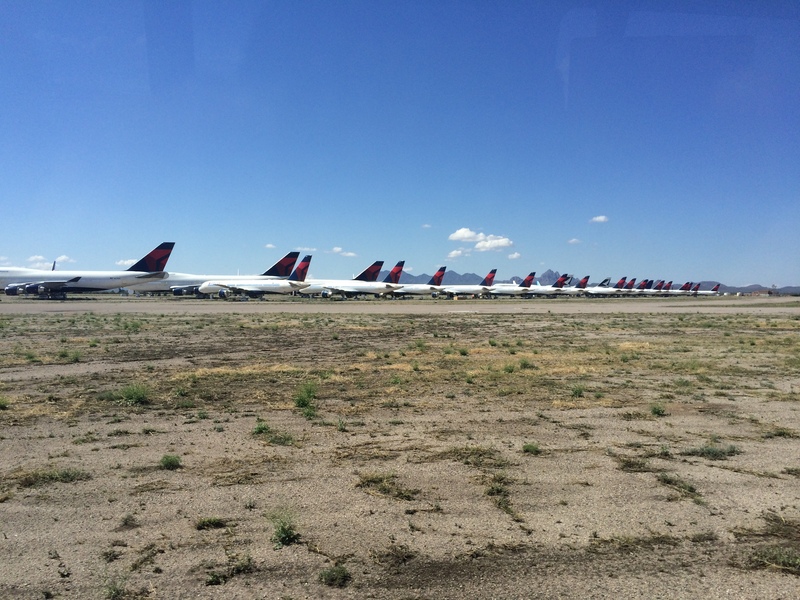 “Delta infinity”: more planes in live storage. Ever wondered where the actual extra planes went when air travel decreased in the recession? Found ’em. Or, have you ever wondered where the aircraft of now-defunct airlines ended up? 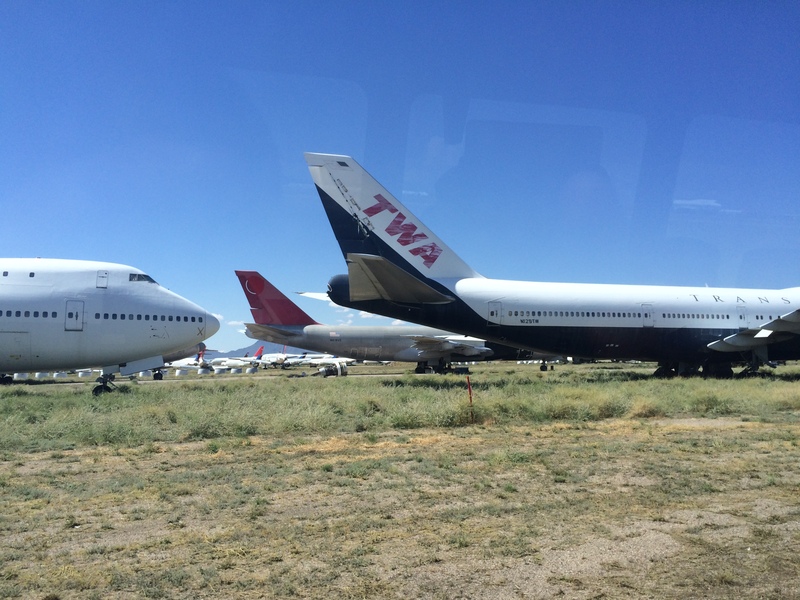 I found this plane from Trans World Airlines, TWA, still sitting here waiting patiently to be harvested and recycled! Planes are flown here — if they are still airworthy — or shipped here from all over the world. Some countries do not allow the planes to be deconstructed in their countries because they’re afraid of both violating environmental regulations, and of creating PR issues. Apparently since the barriers to entry of aircraft deconstruction are low, there are a lot of unscrupulous vendors, like the ones who fly-tipped (illegally dumped) the entire interior of a Ryanair Boeing 747-200, which then washed ashore in Scotland. 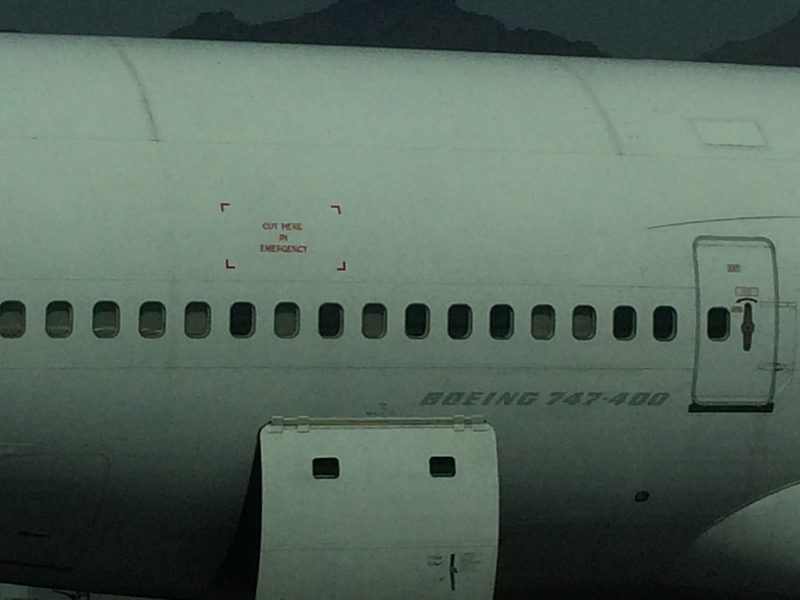 And finally, a bit of a non-sequitur to the recycling of these aircraft, but… does this slightly alarm anyone else?? The end-of-life of aircraft is a rapidly evolving field. 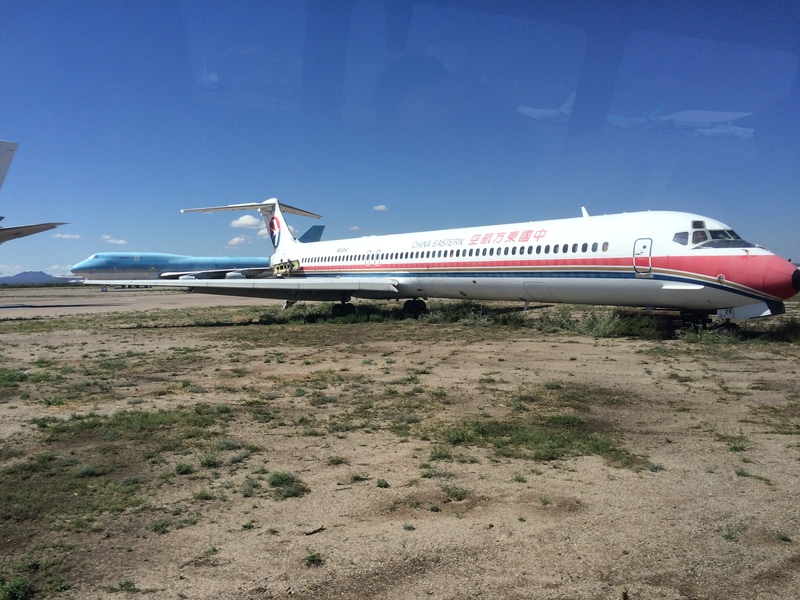 According to GJD Services, a UK-based aircraft disposal company, “over the next 20 years, approximately 5,000 commercial airliners are expected to be withdrawn or retired from service at a rate of approximately 250 per year.” (Read more in this great blog post.) One issue that the industry will increasingly begin to face is how to recycle newer generation aircraft in which carbon-fiber composites, which are incredibly tough to dismantle and to recycle, have replaced aluminum in the aircraft bodies. While the much lighter composite bodies can sip a quarter of the fuel of the first aluminum jets, there may be end-of-life recycling tradeoffs. I’ve learned that the sustainability of the aerospace sector is a pretty complex endeavor, but one that many in the industry are working hard to achieve. Categories: sustainability in an industry | Tags: aerospace, aircraft, aircraft recycling, boeing, iaeg, pinal, recycling | Permalink.